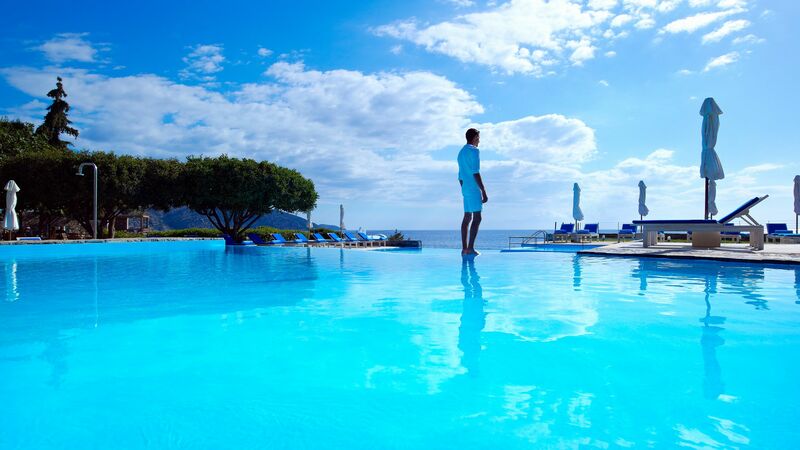 Perfect for couples and families alike, the St Nicolas Bay Resort offers a relaxed and intimate stay and is the perfect base for exploring this beautiful part of Crete. Located within six acres of gardens with the sea on three sides, it’s easy to find privacy and tranquillity here. During the day you can enjoy St Nicolas Bay Resort’s private sandy beach or choose from two swimming pools, one with a separate children’s section which is ideal for family fun. If seclusion is your holiday goal then book one of the stunning Private Pool rooms – an ideal choice for a honeymoon or those wanting to relive theirs. 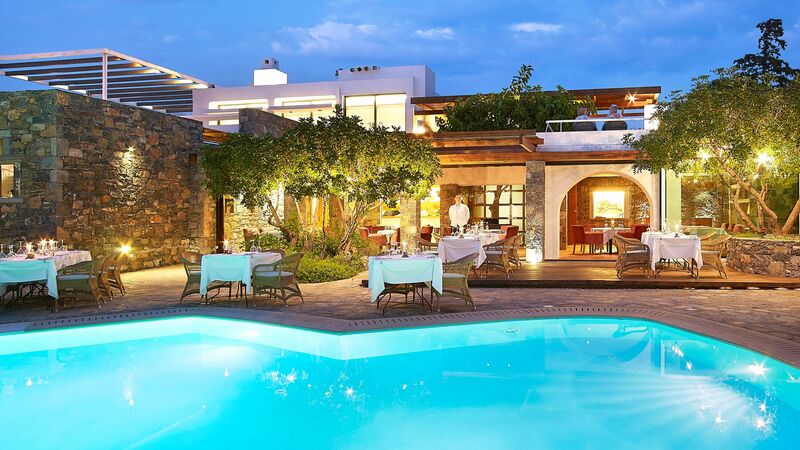 By night it’s time to enjoy the variety of dining options, from a romantic candlelit dinner a deux at the Minotaure to authentic Cretan seafood at The Greek Kafenion. Those wanting to explore can take a trip to the nearby Aghios Nikolaos where there is a whole host of lively bars, delicious tavernas and stylish boutiques. Seeking total relaxation? Make sure you make time for a trip to the Poseidon Spa – with unique features including a private cave for two it’s a must-visit. The hotel has 107 rooms. Hotel child prices apply to age 2–12 years. This fashionable waterside bar serves cocktails against a backdrop of fun music. 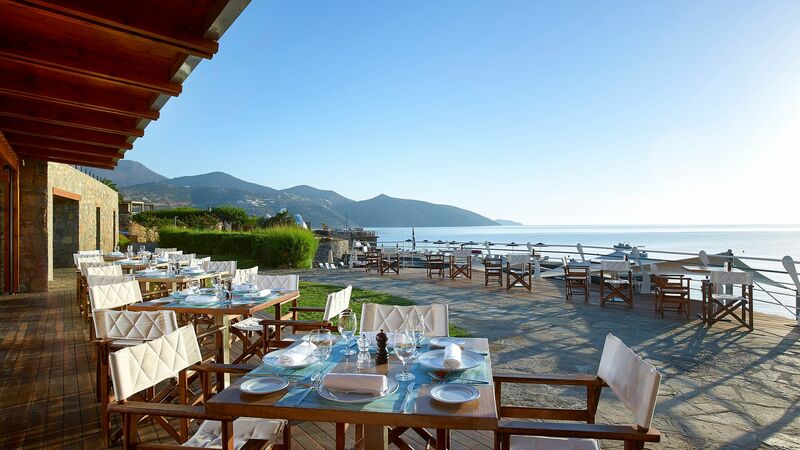 A huge variety of hot and cold breakfast options are served on the shady terrace where you can soak in the views across Mirabello Bay. Offering a selection of traditional local cuisine alongside international flavours, enjoy dinner outside on the outdoor veranda or beat the heat and escape to the cool comfort of inside. Serving Asian and international dishes Minotaure is a romantic choice for a candlelit dinner for two. Guests on half board receive credit towards dining at this restaurant. A fun place for a pre-dinner aperitif or an after dinner digestif the Astar Bar serves delicious drinks in a relaxed piano accompanied atmosphere. For a casual lunch option head to Blue Bay, which serves a mixture of Mediterranean and Asian dishes including vegetarian options. Can’t face leaving your lounger? Cocktails, drinks, sandwiches and ice creams are all served around the pool and beach too. 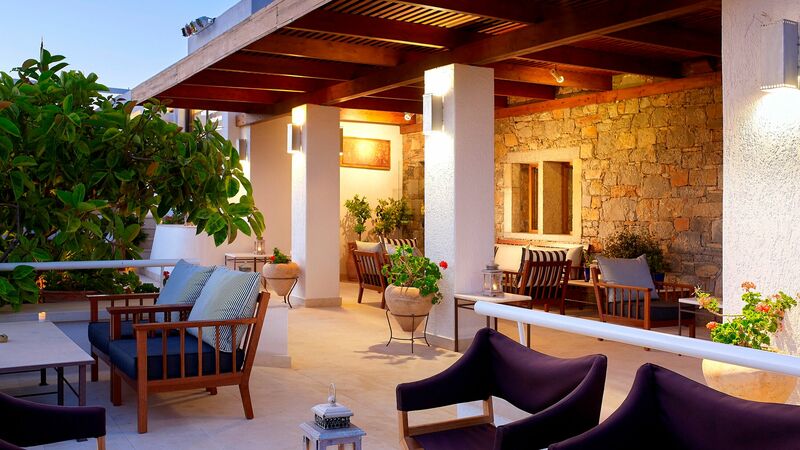 Try an authentic experience with this Cretan themed restaurant located right next to the beach. Relax and enjoy the clear waters of the Mediterranean from the hotels’ private sandy beach. The hotel features two salt water swimming pools, one with a separate children’s area. 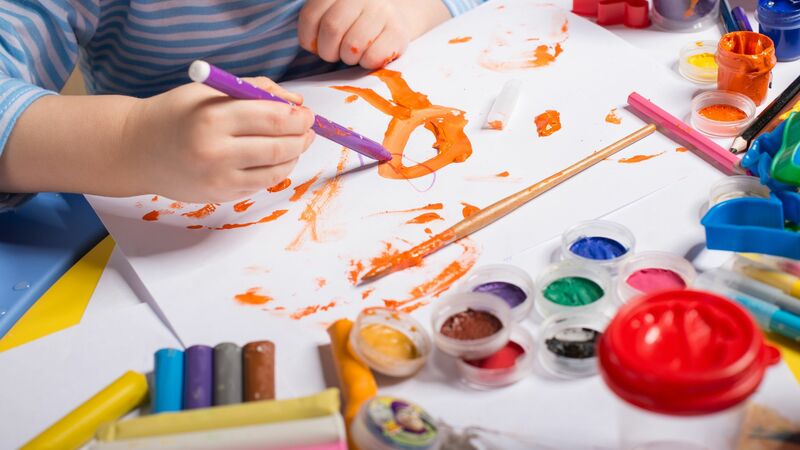 Certified staff run this fun children’s club where kids can take part in a variety of activities. 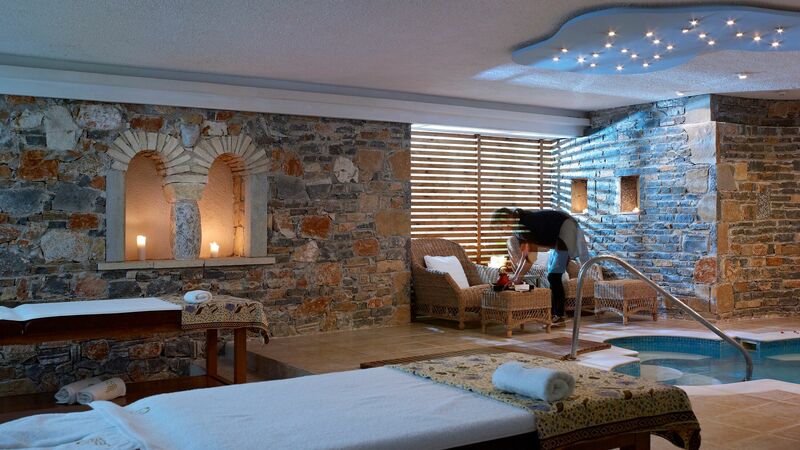 Choose from a wide range of treatments, from facials and massages to manicures and body wraps. There’s also an exceptional array of facilities including a private Thalassotherpay seawater pool and a fully equipped gym. Children under 16 are not permitted in the spa. There’s plenty do to if you’re not just a sun-seeker. Visit the scuba diving centre or try your hand at windsurfing or canoeing. When evening comes there’s an open air cinema that shows films three times a week and a games room complete with table tennis tables, table football and Playstation games. 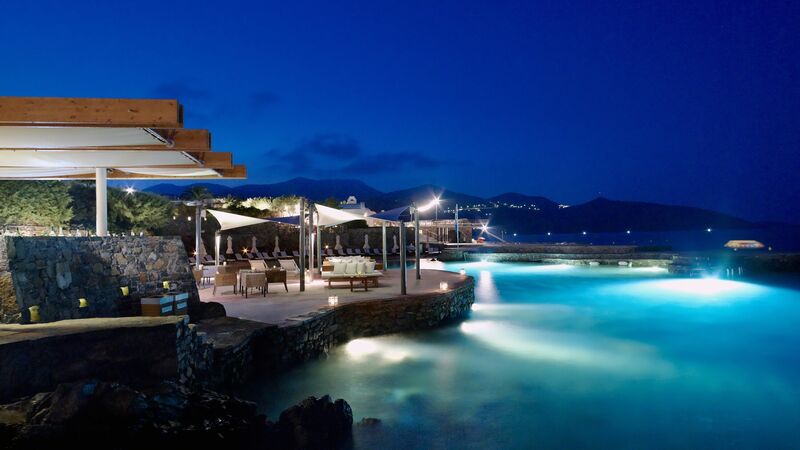 St Nicolas Bay Resort can be found on the north east coast of Crete, in the town of Aghios Nikolaos. Here you’ll find a fascinating sense of history, with colourful Venetian buildings stretching along the coastline and along the shores of the lake. 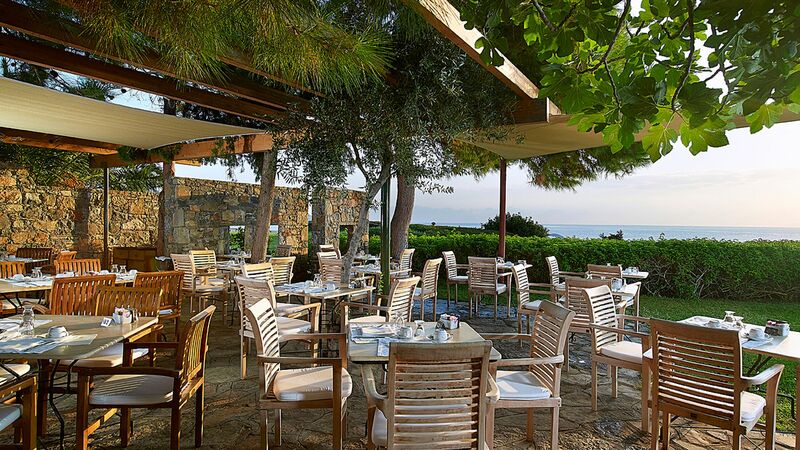 Take in the sparkling waters of the lake, where the goddess Athena is supposed to have bathed, as you enjoy exquisite dishes in the lakeside restaurants. Culture lovers can visit one of the museums in the town, while beach lovers will find lots of stretches of golden sands to be explored. Enjoy fresh seafood in one of the beach restaurants or order refreshments straight to your lounger. 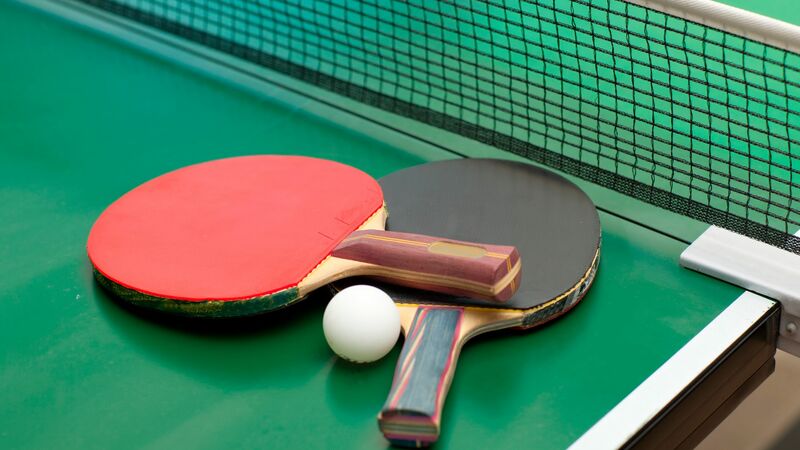 If you want to keep active, there are water sports and activities available as well. 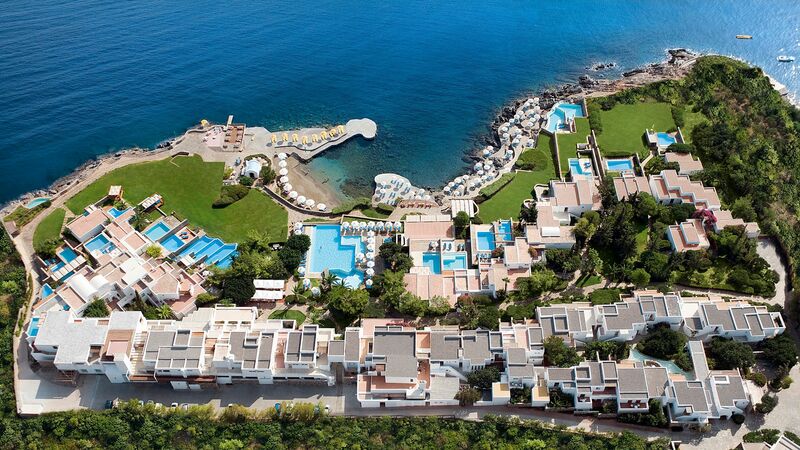 St Nicolas Bay Resort is an hour’s drive from Crete Heraklion Airport. Classic Double Side Sea View Rooms are decorated in a modern style. They have either a king size or twin bed, bathroom with separate toilet and a balcony with a sea view. Classic Junior Suites Sea View have a king size or twin beds, bathroom with a whirlpool style bath or a walk in shower as well as a regular bath tub and a spacious balcony or terrace with sea views. Classic Suites Sea View have spacious private balconies or terraces with large sliding doors and sea views over the Mirabello Bay. They have a separate bedroom with a king size or twin beds and a seating area. Classic Studio Private Pool Sea View have a king size or twin beds and include whirlpool style bath and separate shower. They have a bedroom and open plan lounge and a spacious terrace garden and private heated swimming pool and sun loungers. Classic Suite Private Pool Sea View have a separate bedroom, Jacuzzi bath tub, spacious living room and large terrace garden with private heated swimming pool and sun loungers. Single rooms have a balcony or terrace with views over the gardens. Classic Family Suites Garden View feature a master bedroom with a French bed and ensuite bathroom and a separate lounge with two children's beds. Located by the seafront, the exquisite Suites have a bedroom with large lounge corner, bathroom with a Jacuzzi® bath and walk in shower and spacious Veranda with private heated swimming pool, daybeds and dining table. Guests staying in Club Suites can take advantage of early check-in and late check-out, welcome champagne, mineral water, homemade cookies, welcome cocktails at the Astra Bar, complimentary anti-stress massage and complimentary use of gym, sauna, hammam, games room and home cinema. The Thalassa Villa features a master bedroom with king size bed or twin beds with an en suite bathroom with a Jacuzzi® bath and a walk in shower. There is also a twin room and a single room both with ensuite bathrooms with a walk in shower. The villa also features a spacious living room, dining room, fully equipped kitchen and large terrace with private heated extra sized pool, sunshades and sun loungers. Receive one resort credit of Euro 100 per room per stay to use on food, drinks and spa extras for holidays between 12 April - 24 May 2019. The first and second child (up to 12 years) receive a discount when sharing with two full paying adults for holidays between 12 April - 26 October 2019 (excludes stays in Thalassa Villas). 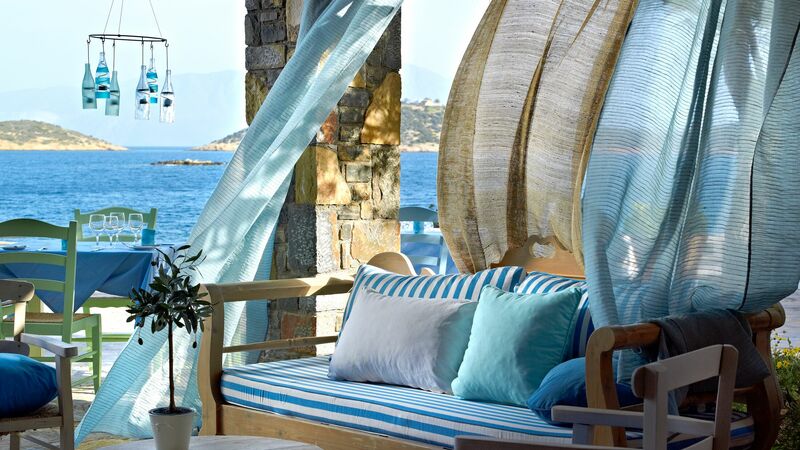 Honeymoon couples receive one bottle of sparkling wine, honey cake and flowers in their room on arrival, one deluxe à la carte dinner (excludes drinks), one massage at the Poseidon Spa and a room upgrade to a Honeymoon Suite Private Pool for their last night stay (except Thalassa Villas) for holidays between 12 April - 26 October 2019 (a minimum stay of 4 nights is required except between 07 July - 28 September 2019 when a minimum of 7 nights stay is required). Having spent nearly 20 days in this hotel (exactly 17), all the staff was tireless. The Astra Bar, was simply amazing to relax with some drinks after dinner and after a long day of boring meetings. The food at the restaurant was glamorous without loosing taste. Breakfast was immense. Almost anything we can remember, was there. All the facilities superb. A must in the island and will be returning the the family. Booked half board villa with pool for family for one week mid October - roughly ??14k. Villa good points: Heated salt/mineral pool with bubble jets; Outside space with ample loungers and dining area; Electric blockout blinds; Sea views; Not overlooked; Good appliances (dishwasher, washing machine, air-con throughout); Very clean. Villa bad points: Furniture sub-standard throughout; Tired old kitchen units; Small bedrooms - 3rd bedroom little more than an under-stairs cupboard; Most clothing has to be stored in a central dressing room as little furniture in rooms; Not enough hot water for family showering; Smelly drains in bathrooms; Dodgy electrical sockets; Long-ish walk from the villa to main hotel (5mins); Only one smoke detector in whole villa. Hotel good points: Quiet location; Small; Plenty of loungers/towels etc. ; Good access to sea via sandy beach for swimming/snorkelling; Very good water-sports staff; Nice building design with ample vegetation. Hotel bad points: Poor wifi throughout; Cold main pool (sea was warmer); No evening entertainment; No nearby shopping/nightlife; Pushy and expensive mini-bar policy (e.g. ?? ?0.90 per Nespresso pod); ?? ?39 per adult on half board for evening events/alternatives and ?? ?50 per adult room only; which puts the value of the half board evening meal at ?? ?11 - and it shows... a very meagre buffet for starters with offer of soup, followed by choice of 3 mains (plus staples like pasta bolognese), followed by meagre buffet dessert and/or ice-cream! Yes, ice-cream scoops in a 5 star hotel for dessert! Water for the table at extra cost; No shuttle-bus in to main town. Local area good points: Main town has nice feel around 'lake' and harbour with good shops, pedestrianised streets and plenty of caf??s. Local area bad points: Main town 20-30min walk away on dodgy/non-existent pavements close to fast traffic; Very run down/deserted outskirts with dilapidated buildings and vandalism; Many shops selling either tourist tat or very high end jewellery - not much in between. Overall, despite the glorious weather and the tranquil surroundings, I left with a feeling of being very underwhelmed. Staff seemed overstretched (you'll see the same faces morning noon and night) and the general area seems to be in financial free-fall. It feels like the hotel is either greedy or is guarding its top line; perhaps it just doesn't know where/how to be generous to high-paying guests? A minor point but in the only (small) complaint I raised over the phone, the receptionist was rude - perhaps a cultural difference? Also, bring insect repellent/bite cream (?? ?2.50 in local shop, ?? ?4.90 in hotel). I hope this is a fair and balanced review. “ Dont believe the hype ! This hotel has a great location and it has very polite reception staff. On our late arrival we got a bottle of bubbly and some sad, soggy sandwiches. Breakfast is excellent and again all staff are very good. That is where the praise stops ..... the buffet for half board guests is extremely poor - with the main course being the worst I have ever experienced. Nobody could call it a 5* hotel ..... tempura fish with egg fried rice and sauce was actually fish fingers in breadcrumbs with stodgy rice and watery fish sauce ! Drinks in the hotel in all bars are higher prices than the Ivy at home ! Toiletries and face cloths were not replenished and requiredcalls to reception. A kettle, free coffee and tea bags and an iron in the room are now standard in 4* hotels never mind 5* and to charge 4.50 for a pot of water and one tea bag are West End prices. Food in all restaurants is very pricey and whilst we do not mind paying for good quality, tasty food we do mind paying for awful food. There are tiny things that could make the difference to be a true 5*. But seriously please re train the chefs ! We booked at the last minute and didn?? ?t know what to expect. From the moment we arrived it was fantastic. The best compliment I can pay is that the service was old school in a great way. The staff were all amazing and couldn?? ?t be more helpful. We were upgraded to a villa which was finished to a fantastic standard. Breakfast is in a lovely setting and was a very extensive buffet and menu. We had lunch above the small port and again a great choice of food which you can also have on your lounger. Yes the food and alcohol is expensive compared to the local places but it?? ?s a step up. We ate in the buffet restaurant one night which comes with half board. Again a very good buffet and menu selection. The most unexpected thing was the small port where the loungers are. The water is so clear and full of all sorts of fish. Our 6 y.o spent most of the day in the sea and we were in and out all day. The main pool looks lovely but the sea was so good we did it get in the pool. There was a Kids club and teen zone with games and movies but we didn?? ?t use them. The TV in our villa let us to log onto our Netflix and amazon accounts which was great. The best thing was there were plenty of kids of all ages but it didn?? ?t feel like it was overrun with families. There were couples and families of all ages and from all countries which made for a cosmopolitan mix. We had a fantastic babysitter one night. No more expensive than home. She took our daughter to dinner and entertained her for hours. We didn?? ?t use the spa but heard good things. There are decent restaurants 15 mins walk away. Ag nic is 30 mins walk or 5 mins in a cab for 6 Euro. There were plenty of cabs even at peak season. Piato and gioma mezze by far the best restaurants compared to the rest which were fairly average. So whether your a couple of any age or a family, I couldn?? ?t recommend this enough. If you looking for somewhere with great service, top spec rooms, family friendly but not overrun then look no further....who needs elounda, been there done that. PS they?? ?ve even refurbished Heraklion airport! It would be hard to beat this resort hotel for quiet relaxation in comfort with good food, extremely attentive staff always polite, helpful and diligent and a lovely small inlet with sand in the rocky surround. A week at the end of October when the temperatures are not too high and there are lovely sun rises and sunsets has been idyllic. 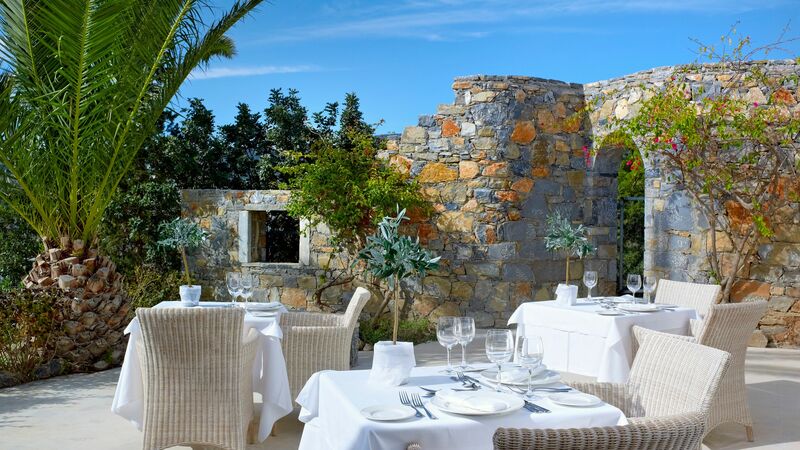 The resort is kept immaculate with all leaves from the the lemon and olive trees swept away first thing in the morning leaving the beautiful paths and stonework of the very attractive architecture to be appreciated all the more. We slipped into a routine of exercise in the gym, a swim at sunrise, an excellent breakfast looking over the swimming pools and sea, then reading, lunch outside looking over the inlet and bay, some more reading or a trip, drinks in a lovely bar admiring the sunset and very good buffets and a la carts from any of three restaurants, and often a late swim to finish the day. Water sports are marvellous, from scuba diving to snorkelling to jet skiing to being towed - as appreciated by the younger visitors on a very bumpy inflatable sofa. Excellent video screens in the rooms, good internet access, and room service three times a day add to the comfort. It?? ?s a difficult task to manage friendly attentive service with high quality friendly people but Nicos Demotzos has certainly managed it impeccably. We will return.